Divertimenti has become widely acclaimed as one of the most exciting and innovative British chamber groups of its generation. 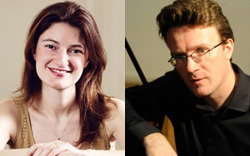 All five are top ranking players with a wealth of world-wide concert experience between them, as soloists and orchestral principals as well as chamber music players. 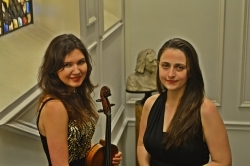 Long standing friends, they share an evergreen love of music making, and a passion for the rich sonorities of the string ensemble repertoire. Schubert’s great C major Quintet forms the backbone of this programme which is paired in this concert with the Quintet by Ethel Smyth, a life-long champion of women's rights, whose work was featured on BBC 3’s Composer of the Week earlier this year. Described as "an amazingly talented pianist" by the leading Italian magazine Musica, the Neapolitan pianist EMMA ABBATE pursues a varied career as a chamber musician and vocal coach. Emma is planning a series of recordings devoted to 20th century Italian vocal chamber music and the world-première recording of Stephen Dodgson’s Piano Quintets with the Tippett Quartet. A graduate of English National Opera’s prestigious Baylis Programme, JULIAN PERKINS has a growing reputation as a keyboard player and conductor. He has made solo and chamber recordings on a wide range of instruments, including the harpsichord and clavichord. He has appeared with many leading soloists and ensembles including the Orchestra of the Age of Enlightenment and his own group, Sounds Baroque. 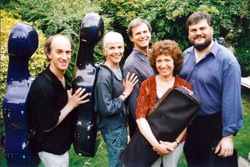 Galliarda is a unique small early music group formed in 2010 and consists of highly respected performers who have wide experience of performing internationally, recording, teaching and research in the fields of Renaissance and Baroque Music. 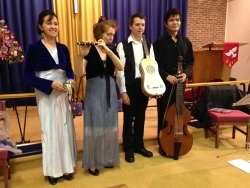 They present an unusual combination of instruments, offering maximum variety, with soprano voice, two viols, recorder(s) or flute, combined with lute, early guitar, theorbo and percussion. This concert is entitled ‘Josep i Maria’, named after a Catalan Christmas carol. The traditional carols from the different regions of Spain are strongly featured in the first part of the programme, together with folk dance music and other Christmas songs from France, Germany and England. The second part of the concert moves into the baroque era with festive works chosen from composers such as Handel, Telemann, Purcell, Arne and Rosenmüller. Ugne Tiskute is a young and vibrant violist, who has already established herself as an internationally renowned musician and winner of various international competitions. 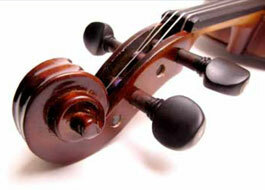 Ugne began her studies at the age of six on the violin. At the age of sixteen she got fascinated by the deep, rich sound of viola which she then studied firstly in Vilnius and from 2009 at the Royal Academy of Music. Ugne plays a 1780 Salomon viola. Romanian-born Alexandra Vaduva started playing the piano at the age of four. Since then she has won numerous national and international piano competitions. She is currently in her final year at the Royal Academy of Music. The Allegri is delighted to announce the appointment of a new first violin Martyn Jackson, following the departure of Ofer Falk, who after more than 20 years of near continuous quartet playing, wanted to explore other avenues. Martyn is a graduate of London’s Royal College of Music and has performed as a soloist throughout Europe and the Middle East. He previously led the Cavaleri Quartet and has frequently served as assistant concertmaster of the London Symphony Orchestra, Philharmonia Orchestra and BBC Scottish Symphony Orchestra. He plays on a Jean-Baptiste Vuillaume kindly on loan to him from Frau Angela Schmeink. The Allegri was formed in 1953 by violinist Eli Goren and cello pedagogue William Pleeth, who recruited violist Patrick Ireland and second violin James Barton. 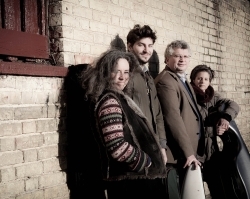 Evolving through many changes of personnel the Quartet has maintained a key role on the British musical scene and like all senior professional String Quartets, the members of the Allegri teach and give masterclasses as well as performing and recording.